Thanks for this post! This is a topic that has always confused me. With man being created in the image of God, it seems logical to expect that something as fundamental as His triune nature would be present in what we are. Precisely what those parts are, how they relate to each other, and how they are analogous to God are beyond me though. I was wondering about a couple things… I agree that the soul is an intangible that includes the mind, emotions, and will. But what do you make of physical injuries that cause mental disabilities, emotional changes, and the loss of self-control? Also, would you say that self-awareness is sourced from the spirit? David LaPierre HI David… thanks for chiming in. The mystery of how the physical impacts the soul is exactly that – mysterious. But not outside God’s intended design and plan, and it happens in much less extreme situations than what you suggest. For example, for some reason, when I don’t get enough sleep, I tend more toward irritability and therefore find it much harder to walk in the Spirit as I am commanded. So, a physical limitation is impacting the capacity of my soul. I’d say when such things happen in a drastic way as you mentioned the LORD is sovereign over them, and is using the individual for His purposes. What does that say for their personal responsibility? A person born mentally handicapped is, I think, responsible within the limits of their capacity. Regarding self-awareness, I’d argue it’s in the soul, not the spirit. Non-believers have self-awareness, but the scriptures say that non-believers have a “dead” spirit (as mentioned in the presentation). So if self-awareness were in the spirit, non believers would not be self-aware apart from Christ. Carey Green That is a good point. I’ve never really realized before that if non-believers are truly dead spiritually, then it would seem that they would completely lack everything that is sourced in the spirit. I hadn’t even considered the question of personal responsibility yet, but that does make sense that it is based on capacity. 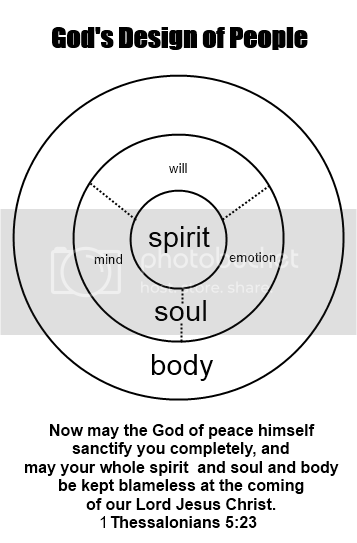 I was thinking more along the lines of how aspects of the soul seem to have their origins in our physical bodies. I think almost every part of the body has been lost, transplanted, or artificially replaced in someone at some point without the death or uncontrollable change in the person, except the brain. Damage there can cause absolute limitations, and, as far as we know, the brain cannot be artificially replaced while preserving the person. At the same time though, we have never been able to create emotions, understanding, will, or self-awareness in a machine. I know it’s not a vital question, it’s interesting though. Hope to meet you soon too, I’m looking forward to the retreat! Carey GreenI’ll check that out, thanks!